For years, Realtors®, lawyers, and other real estate industry professionals have presented buyers and sellers with a list of home inspection companies in an effort to reduce their professional liability. However, this approach to professional real estate agent risk management has not been consistently effective. After all, if a home inspection firm on your list is uninsured, unlicensed or otherwise unqualified - real estate professionals are often still left defending themselves. Your local HouseMaster office encourages real estate professionals to let the customer choose their own home inspector with guidance on how to select a quality home inspection company. Providing information on how to select an inspector, whether via brochure or internet, will be appreciated and can help reduce your exposure for professional liability. Customers can then use your guidelines to verify the credentials of local inspection services and learn for themselves which firm they feel will best suit their needs. Should a post-sale problem arise, HouseMaster offices maintain Errors & Omissions Insurance (also know as professional liability insurance) which names select real estate service providers as additional insured parties. In addition HouseMaster offices stand behind their inspection services with a Limited Inspection Guarantee, where applicable. 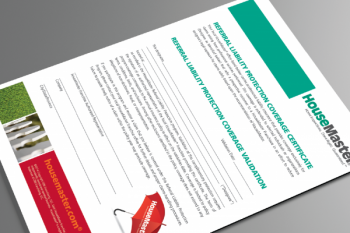 This guarantee addresses eligible issues that arise after closing within the guarantee period to help ensure a happy home buyer and less post sale issues for the professional real estate agent and all parties. And since both the National Association of Realtors and the Canadian Real Estate Association encourage their members to develop an aggressive program of risk management, we believe our Referral Liability Protection Program combined with the exclusive HouseMaster Limited Inspection Guarantee should be two key elements of these programs. Contact your local HouseMaster franchise for program availability and details.